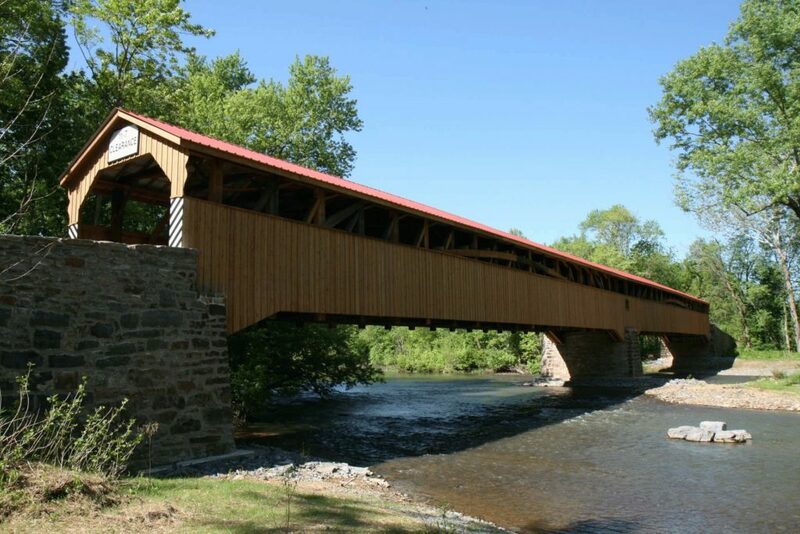 Preservation of historic sites has also become part of our mission and we are proud to own the Pomeroy Academia Covered Bridge, which at 278’4″ feet, is the longest remaining covered bridge in Pennsylvania. Listed on the National Register of Historic Places it crosses the Tuscarora Creek near Academia. Built in 1902 by James N. Groninger, the Bridge is a double span Burr Arch design. In June 2009 the Society completed an eight year, $1.4 M restoration of the Bridge. From Mifflintown area: Take Rt. 75 south/west about 5 miles through the town of Port Royal. Continue on Rt. 75 until reaching the former Spruce Hill Lunch. Turn slight right onto Spruce Hill Rd. [SR 3013]. Drive approximately 1 mile to the Tuscarora Creek. The Pomeroy Bridge can be reached on either side of the Tuscarora Creek. Turn right onto Covered Bridge Road [before crossing the Creek] or turn right onto Mill Rd. after crossing the Creek. Parking is on the side of the road. Handicap access is available on either side but you can park closer to the bridge on Covered Bridge Road. From Rt 35: turn at Cross Rd [T388]. Cross Rd. is approximately 9 miles south/west of Mifflin, PA on Rt 35. If driving from the south/west turn right onto Cross Rd; if driving from Mifflin, PA turn left onto Cross Rd. Drive .6 mile on Cross Rd to intersection of Cross Rd. and Academia Rd [SR 3017]. Turn right and follow this winding road 1.1 miles to intersection of Academy Rd. [SR3015] and Academia Rd. [SR 3017]. Turn left on the Academy. Rd and drive to stop sign. Turn left onto Groninger Valley Rd. Drive approximately 100 yards and turn right onto Spruce Hill Rd [SR 3013] Drive less than 1 mile, turn left onto Mill Rd. or cross the Tuscarora Creek and turn left onto Covered Bridge Rd. Driving out of the driveway of the Museum, turn right, then turn right again onto SR 3015 Academy Rd. Drive to stop sign [barn on left]; turn left onto Groninger Valley Rd. SR 3008. Drive a short distance and turn left onto Spruce Hill Rd SR 3013. Drive to bottom of hill and turn left on Mill Rd. Park on side of road. Bridge is on the left. 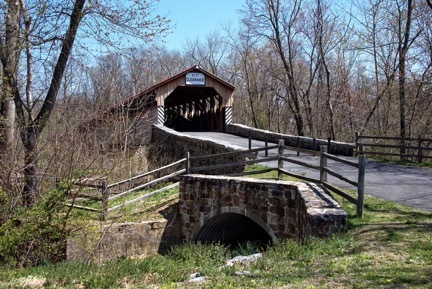 OR drive across Tuscarora Creek, turn left onto Covered Bridge Rd. The Book Indian Mound is a historic site in Beale Township known at least to those who live in the Academia area. One early publication by U.J. Jones called History of the Early Settlement of the Juniata Valley, published in 1889 mentions the mound. Until 1929, when archaeologists from the Pennsylvania Historical Commission completed their excavation, nothing was known to explain its purpose, size or contents. Early landowners, unappreciative and disregarding its significance to the Native American culture, scattered most its contents over their fields as fertilizer. Others, like students from the Tuscarora Academy, searched the mound and removed Indian relics. By the time the Commission’s investigative dig, the plow and vandalism had significantly altered the mound’s characteristic elements. Driving out of the driveway of the Museum, turn right, than turn right again onto SR 3015 Academy Rd. Drive to stop sign [barn on left]; turn right onto Groninger Valley Rd. SR 3008. Drive 1.4 miles on Groninger Valley Rd. Turn left onto SR 3019 Indian Mound Rd. Drive .4 miles; the Indian Mound in on the right in the field. In May, 1873 Mr. L.M. Simon, an architect from Harrisburg was requested to draw plans for a new courthouse. On June 1, 1873, a contract was made with John B.M. Todd to deliver at the courthouse 425,000 good brick & 20,000 pressed brick. In July 1873 advertisements for proposals were prepared and bids for the “erection and enlargement of the Court House” were accepted by the commissioners on August 11. 1873. Messers. 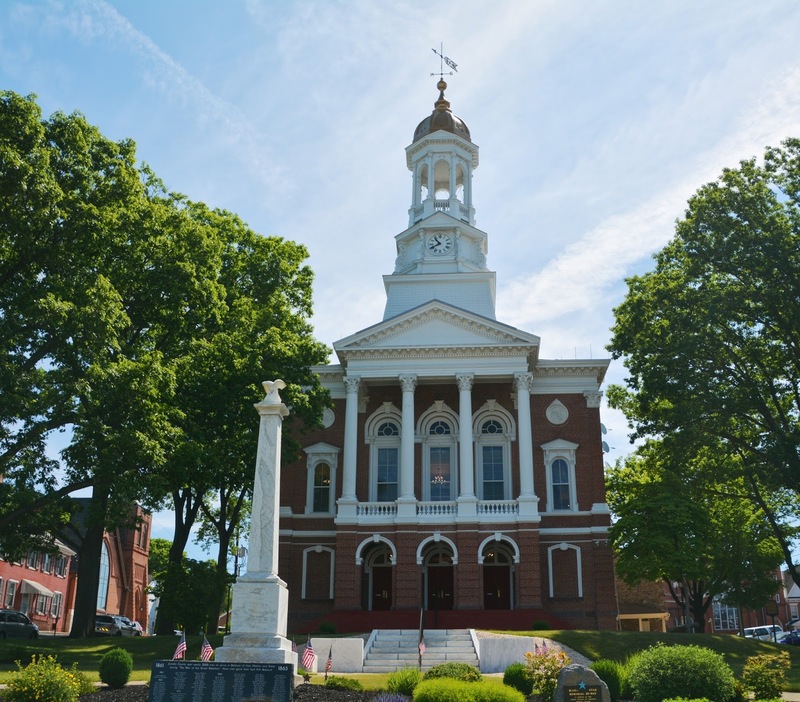 Hetrich & Fleisher of Newport, Perry County, were awarded a contract to build a new courthouse in accordance with plans and specifications for the sum of $42,100.00, to be completed by January 1, 1875. The courthouse was completed according to contract with the addition of a bell tower, clock, furniture, pavement, fences and other improvements for a total cost of $63,000.00. The current courthouse is actually the second one used to house the county’s government. 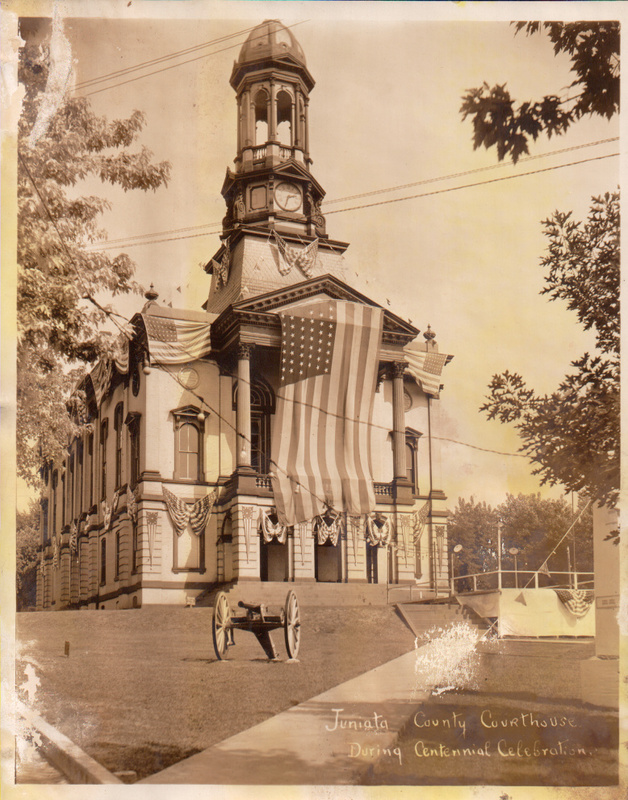 The First Juniata County Courthouse was actually constructed in 1833 according to plans prepared by Thomas McCurdy. The plans were accepted by the County Commissioners and a contract was made with Ames Gustine and Everett Oles for the erection of a courthouse at a cost of $3,940.00. 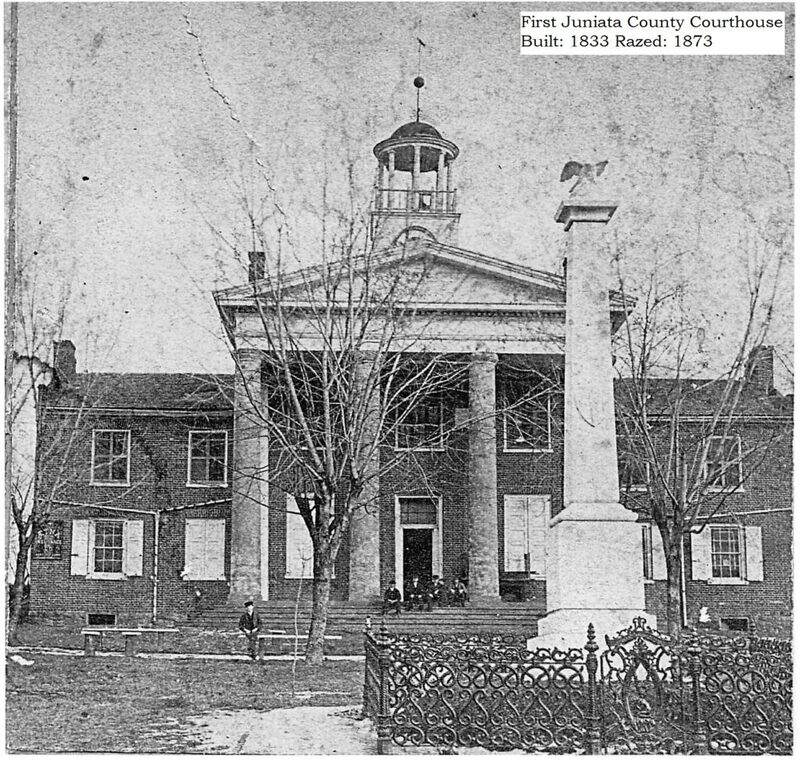 The first courthouse was in use until 1873 when the building was razed. A revolving display of county artifacts has been setup in the bookcases in the hallways of the courthouse by the Juniata County Historical Society.